Your Student Desktop H:\ Drive only has a limited amount of storage space, so you should store extra files on your University of Otago OneDrive. We recommend you keep files you are currently working on in your H:\ Drive, then transfer them to your OneDrive for storage. Another advantage to your OneDrive is that although you can access the Student Desktop from anywhere on any computer, you can access your OneDrive through your StudentMail without needing to log in to the Student Desktop at all. 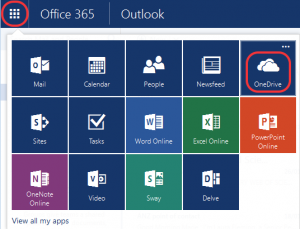 You can even edit files within OneDrive, without having to download them, using Office 365 Online. 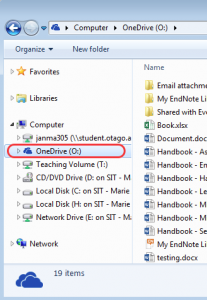 If you would like to save or open files using your OneDrive within a program such as Microsoft Word, use the folder OneDrive – University of Otago as demonstrated below. 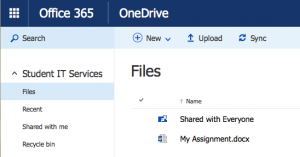 From the online OneDrive, you can open, upload, or create new files using the menu bar at the top of the screen. If you open or create a new file, it will open directly in your web browser using Office 365 Online. The file will download to your downloads folder, or you will be asked whether to open or save the file. Important! If you want to edit the file, make sure you download the file rather than opening it or any changes you make may not be saved.